Learning how to clean kegerator lines is an essential part of being a home brewer. You probably spend countless hours and considerable amounts of money making your own brew at home. You therefore want to make sure that what comes out of the tap is as pure and fresh-tasting as it can be. But cleaning kegerator lines isn’t exactly an easy task. Clearing out the muck and sediments that collect on the insides of the pipes and couplers can be next to impossible, even with household solutions. 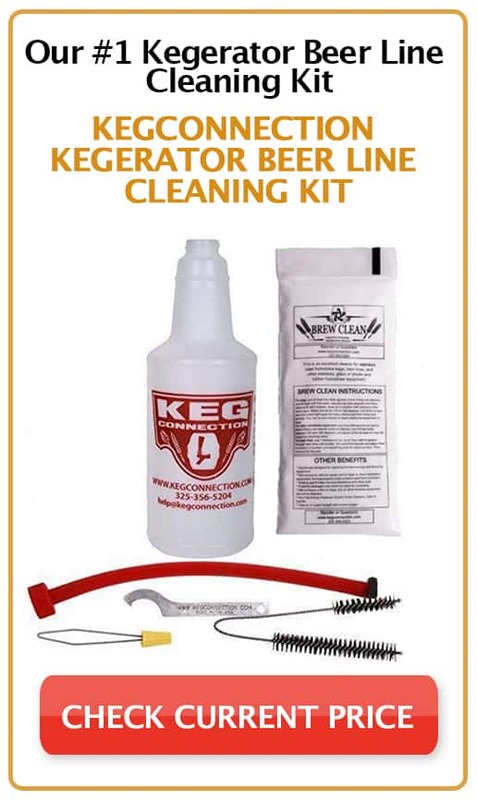 Thankfully, there are a number of cleaning kits that can help get your kegerator back to pristine condition. Here we review three of the most effective solutions available. 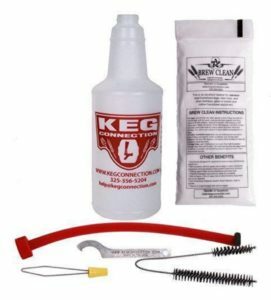 Kegconnection comes with everything you need to clean your kegerator. The most important component is the 8-ounce pack of “Brew Clean” line cleaner. Mixed with hot water, the solution is coursed through the system during cleansing. The kit comes with enough solution for about 20 cleanings. The kegerator kit comes with a drip bottle with a hose that fits onto your faucet pipe. Simply remove the faucet with the included wrench then fit the hose onto the pipe. Tip the bottle upside down and gravity will take care of the rest. You also get a ball lifter, which pushes the ball up and away from the coupler opening. This ensures that the cleaning solution flows freely through the kegerator beer line. The kit also comes with a brush for removing stubborn buildups. 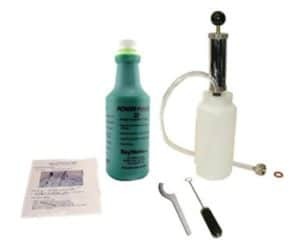 The Taprite Kegerator Cleaning Kit cleans your keg system and keeps it free from bacteria, mold, and yeast buildup. 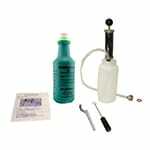 It includes a one-quart shatter-proof bottle for holding the compound. The Taprite also comes with a faucet brush for removing residue from the kegerator. There is also a check ball lifter that pushes the check ball out of the way so that the cleaning solution flows through the system. However, the cleaning solution provided with the Taprite kit isn’t quite as efficient as Kegconnection’s Brew Clean. With the Taprite, you have to soak your beer lines for 20 minutes or more. The KegWorks Deluxe is a beer line cleaner that clears out residue buildup in your kegerator system. The KegWorks pushes the cleaning solution through the system with considerable pressure that you can actually see the solution working its way through the equipment. 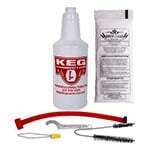 The KegWorks kit comes with a one-quart plastic jar and pump assembly, a faucet wrench, a brush, and a 32-ounce pack of KegWorks Brand Beer Line Cleaning Solution. Unfortunately, the hose doesn’t fit precisely onto tap connectors. This often causes spills due to the strong pressure. The solution also leaves a green stain on the inside of the beer line, which doesn’t wash out. 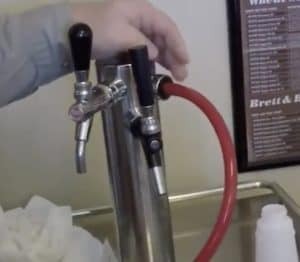 Here’s how to clean beer lines using the Kegconnection Keg Cleaning Kit. Step 1 – Detach the lines from your kegerator and close the tank to prevent the brew from spilling out. Step 2 – Take off the tap handle. 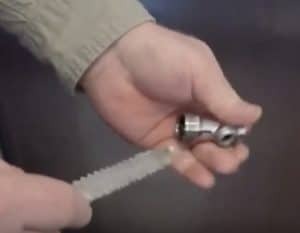 Use the supplied faucet wrench to loosen the kegerator faucet and expose the threads. This is where you will attach the hose from the drip bottle. Step 3 – Place one heaping tablespoon of Brew Clean line cleaner powder into half a gallon of hot water. Mix thoroughly until the powder is thoroughly dissolved. Step 4 – Place the cleaning solution in the included gravity feed bottle. You should have enough solution left in the bowl to fill the bottle one more time. The solution will also be used to clean out the coupler and the faucet. Step 5 – Soak the faucet and coupler mechanism in the solution in a bowl. It might be a good idea to let them soak for a while in the cleaner, especially if there is a lot of buildup in your beer lines. Step 6 – Insert the included ball lifter into the coupler to ensure that the check ball is lifted up clear of the coupler’s opening. This ensures that the solution flows through the beer lines unimpeded. Step 7 – Attach the gravity feed bottle to the faucet pipe. The bottle is probably going to be extremely hot to the touch, so you might want to wrap it in a towel before you proceed to the next step. Step 8 – Tip the bottle over and let the cleaning solution flow through the beer line and out of the coupler into the bowl. If the bottle collapses in on itself, detach it from the hose and let some air back in so that it regains its shape. If necessary, run the solution a couple more times through your system. You should be able to use the same solution if you keep your kegerator reasonably clean. Otherwise, you may have to mix up a fresh batch of cleaner. Step 9 – Flush your beer line with plenty of warm water. Although Brew Clean is food-safe, you might want to rinse out your system twice, just to make sure that no trace of the solution remains. Step 10 – Scrub the coupler and the faucet mechanism with the included brush. Rinse these with warm water before reassembling your kegerator. All three of the products reviewed here can do a great job of keeping your equipment clean and free from cruddy buildups. But the one that stands out in particular is the Kegconnection Kegerator Beer Line Cleaning Kit. 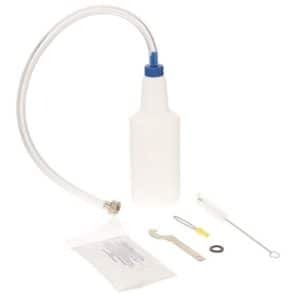 A simple and elegant solution to the frequent need to clean out beer keg lines, the Kegconnection Kegerator Kit somehow manages to do a better job of getting the hoses and couplers sparkling clean. You can actually see the residue clearing up after just one application, and a second cycle pretty much renders the entire system spotless. 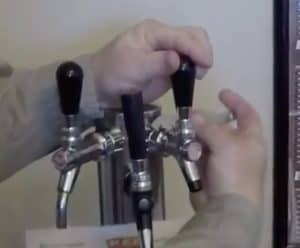 If you have ever wondered the steps in cleaning beer lines quickly and easily, there is no better solution than the Kegconnection Kegerator kit. 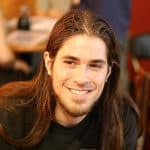 Previous Post What’s the Best Homebrew Sanitizer & Cleaner?